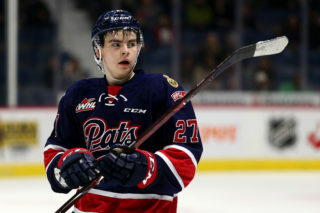 Regina, Saskatchewan – A new look Regina Pats (25-12-2-1) downed the Everett Silvertips (24-12-3-1), 3-1, with the help of a new addition and a pair of new leaders. The first half of the opening stanza was defensively sound. The Pats and Tips combined for a total of four shots by the 10 minute mark with two apiece. 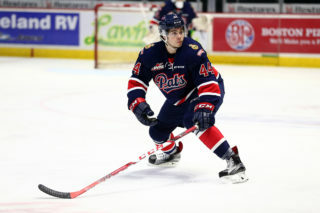 Thirty seconds after the midway point of the frame, Braden Christoffer showed why he was appointed the Pats’ new captain. The gritty forward battled in front of the Tips’ cage and slid home a power play goal to put the Blue and White ahead, 1-0. 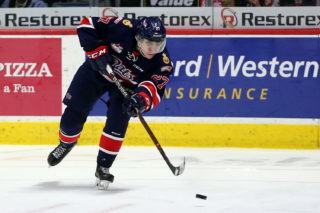 Montreal Canadiens prospect Nikita Scherbak responded for the visitors with seven minutes left on the clock. The first period came to a close with the score tied, 1-1. The Pats led on the shot clock, 10-8. Pats defenseman Sergey Zborovskiy and Colby Williams were called for back-to-back minors in the second frame. The Queen City Kids survived both kills courtesy of their net minder, Tyler Brown, who came up with multiple big saves to bail out his squad. The Pats had a few man advantages of their own, but Brown’s counterpart, Austin Lotz, was up to the task as well. As time wound down, line mates Adam Brooks, Pavel Padakin, and Austin Wagner began to buzz. Eventually, their hunger for a tally paid off when Brooks found Padakin wide open who beat a sprawling Lotz. Padakin’s 10th of the year gave the Blue and White a 2-1 lead heading into the second intermission. The Pats dominated in the shot category, 28-14, after 40 minutes. 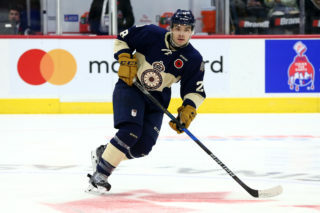 Patrick D’Amico showcased some slick hands in the third as he dangled around a Tips defenseman and got a quality scoring chance. Lotz turned away the Pats forward with a right shoulder save. The visitors came back with a flurry of doorstep chances in front of Brown. Once again, the goaltender continued to steal the show and the score remained in the Pats’ favour halfway through the final period. Brown dodged a bullet, though, when a bouncing dump-in handcuffed his glove and barely skipped wide. Moments later, Jesse Gabrielle gave Brown some insurance when he potted his first as a Pat. Following the goal, Wagner darted to the referee to grab the puck as a memento of Gabrielle’s accomplishment. The Pats’ goaltender was a monster in the final stages of the game as he shut the door to hold onto a 3-1 win. 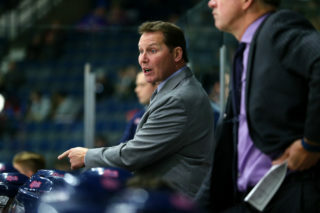 The Pats will have day of rest before their date with the Edmonton Oil Kings on Friday night at the Brandt Centre. Puck drop is at 7:00 p.m. Remember to tune in with Home Depot Pats Hockey on 620 CKRM or WHL Live Web TV starting at 6:35 p.m.